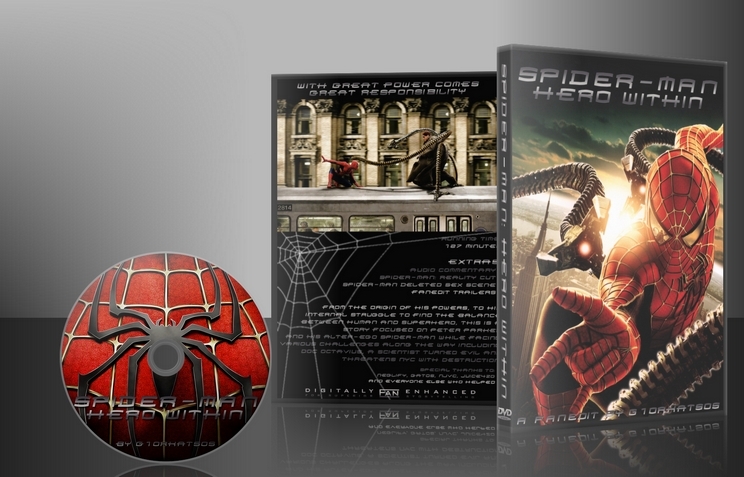 I am combining the origin story from the 1st film with the villain from the 2nd film (Doc Ock) and any scene from the 3rd on that could be useful to make a new story mostly on Peter and his journey to become a hero, simplifying the awful romance with Mary-Jane to the very basics and essentials, removing all useless side characters, getting rid of some side-plots and making it a little more serious by removing many of the stupid campy stuff from the first 2 movies. To make the best possible Spider-Man movie out of the Sam Raimi Trilogy (with the focus on films 1 and 2) while keeping it at a 2 hour length like any normal super-hero movie. Neglify and Juice4z0 for doing the commentary with me. Gatos, njvc and Neglify again for reviewing my work-print and giving me useful feedback on it. And also to everyone else that helped in whatever capacity on making this edit. -The introduction scene for Spider-Man is changed. A heavily edited version of the crane scene from no3 is used. -The whole BoneSaw segment is much shorter and much more tolerable. Most of his dialogue is cut. -Norman Osborn / Green Goblin is removed completely. Harry mentions him once, and we understand that he died sometime before the fan-edit. He never became Green Goblin or anything. -Aunt May's cliched speeches are much shorter and only the important stuff are left. She is more to the point. 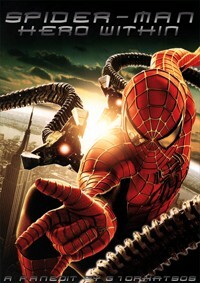 -the Doc Ock plot is preety much the same except for one thing. He goes after Spider-man at the train scene to get rid of him, so that he wouldn't try to stop his 2nd experiment, amd because he was getting suspicious from his absence(at that ime Peter gives up being a hero). After they finish the battle at the train he leaves him unconscious lying there, because he thinks he is dead. Also he gets the Tritium simply by scaring Harry while holding him out of the balcony. this edit for me is both rewarding and frustrating, it's a great idea in combing both spider-man films and for the most part is executed really well. the removal of the goblin as the villain is done brilliantly not once does it effect the edit especially when we get to spider-man 2 and harrys vendetta against spider-man. i liked the way doc ock isn't introduced until an hour into the film, it gives us the chance to focus more on peter parker and his transformation rather than skipping back and forth from hero to villain. the flow between spider-man 1 to 2 is done well it wasn't obvious that one film had finished and another had began. however they are many problems i had with the edit one being when doc ock returns to the train. when doc ock announces to mary jane that spider-man is dead my first reaction was when did this happen. given the encounters they've had with one another during the film spider-man wouldn't have been killed by doc ock by hitting him on the head. it would have played out better if doc ock just per-summed spider-man had died when he fled from the train as it was about to crash. it's one of the main problems i had with the edit as i feel a few scenes weren't warranted, at just over 2hours it felt a little leggy at times. as overs have said the relationship between peter and mary just seems a little off and this is one of the important parts of the edit. as others have said the inclusion of the spider-man 3 clip didn't work, not because it introduces us to gwen stacy but because it wasn't to long ago that peter parker was struggling to control his web slinging but now he's making a big entrance (almost showing off) i feel it would be best showing spider-man taking out street criminals and build-up to a more confident spider-man. overall i felt that they was too much plot going on what with him becoming spider-man, having to face off against doc ock and being in love with mary jane. it would have been more challenging to remove the story in which peter loses his powers, for me it over complicates the edit. the first 30mins they are a few transitions that didn't work and i really agree that the film needed humor. this is an entertaining fanedit but for me the negatives out wayed the positives but given the general favourable reviews and it's fanedit of the month status i know i'm in the minority here. Why did I not watch this one sooner? G1's Spidey was Spectacularly and Amazingly Entertaining! I can easily see why this edit won FEOTM. While there are some minor technical things here and there (as other have mentioned in other reviews), I found them easily foregivable as the story moves at such a great pace and is restructured enough that it feels fresh and new. And I did not realize it until the edit the was over -- NO NORMAN OSBORN!?!?! It hit me like a ton bricks at the end! I was having such a good time, I did not even realize he had been cut. This is an incredible piece of editing in my opinion since this character haunts and shapes the entire original Spidey trilogy. Great work G1! If I were to nitpick, I would have liked a better sense of a passage of time. I think a montage or two may have assisted with this, particularly in moving Peter from High School to University to his life in the city. Also, I am not certain Peter losing his powers fit with the over all arc in this version. It felt too soon for that drama, though I would have definitely keep the courtship scenes. And as others have pointed out, I would have to agree the final Venom tease would have worked better as a post credit teaser. But as I said above, G1 has crafted such a wonderfully fun and engaging story, expertly choosing the best parts from the trilogy, that any shortcomings are, for the most part, very easy to over look. It is a fun popcorn ride! Thumbs Up! G1's fanedit of Spiderman Hero Within has all of the promisings of a great endeavor, and all of the faults that come with lackluster source material. Speaking first to technical side, G1's Hero Within is exceptionally well done. With rare exception, all cuts, fades and transitions are done seemlessly with the original. Unless one is already familiar with the Spiderman movies, I doubt more than two or three cuts would be discovered. Considering the dozens and dozens of edits and splicing between the three movies, this is quite an accomplishment. Unfortunately, as a stand alone movie, Hero Within carries with it some heavy problems. The primary being that, throughout the three movies made for Spidey, none have a really compelling villian. G1 chooses to focus the story's second act against Doc Oct. While he is the most interesting of the lot, it isn't saying much. Doc Oct is a character that stretches credulity beyond reproach. This is easier to swallow in the original as Doc Oct is featured in a movie outside of the already near-proposterous origins narrative. Specifically what G1 has done here is taken the Spidey origins story from the first movie and used the second and third act of the second film to finish it up. However, while the story takes off at a pretty good pace leading up to the donning of the costume, when the film then starts heavily using footage from the second movie, a lot of jarring predicaments occur. For example, Spiderman goes from being a typical highschool student to a peerless collegiate-level physicist after a short span of fighting crime. Although I could be misrembering, I thought that the primary reason Parker doesn't act on MJ's advances is that he's worried that, as Spiderman, those closest to him could be endangered. However, since that isn't established here, his denying of her flirtatious behavior makes him look weak and pathetic, not noble. Also, G1 makes the decision here to follow Spiderman's arc in which he gives up being Spiderman. This is much more effective in the second movie as there's more time to establish for Parker that living a normal life and being Spiderman are incompatible. Here, though, after a long succesful string of fighting crime, Peter gives up the costume almost inexplicably. It's not very convincing. There was one moment of this edit that really got my attention. After the first act is complete, G1 then has a series of "Spiderman helps NYC" scenes. He first cuts to the amazing sequence in the third Spiderman movie where an uncontrollable crane demolishes a section of a skyscraper. This is the first time G1 uses footage from the third and I was anxiously excited in the hopes that he would introduce Gwen Stacy into the mix. There was a moment in which I thought this edit would really develop the relationship foils between MJ/Spidey/Parker/Gwen/Harry. However, this is never idealized as Gwen is only used here as a set peice. I'm not sure what would make this approach to retooling Spiderman better. 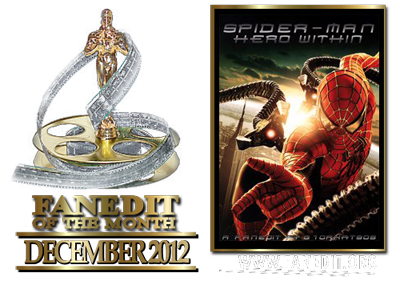 Adding more scenes could make the film more "epic" specifically in following Spiderman's character arc. However, more scenes means needing more conflict, which means adding Goblin, Venom and/or Sandman which is sure to hurt more than it would help. I think G1 did a marvelous job towards his main objective. However, I'm left feeling that this edit doesn't necessarily improve upon the lackluster source material from which it derives. An interesting take on the films, seamlessly blended together. Unfortunately, the whole does not equal the sum of the parts – Hero Within is a weaker film than both 1 and 2 (although better than 3!). It’s an action heavy film, with some great set pieces. Pacing is generally quite good. Editing is technically very well done, as is the sound. Visually and aurally it was excellent. The structure of the film, the narrative, was quite clear, but the characters didn’t have room to breathe and grow. It was a bit action-movie-ish where the characters are secondary to the plot/set-pieces. The ultimate problem is too much being packed into one film. Peter’s emotional journey is up and down and up and down. The love story gets abruptly forgotten along the way, and when we finally see MJ again after about 30minutes (in the café) there’s two seconds of dialogue before the action starts again. The love story ended up, therefore, having very little resonance. The lack of love story also breaks Peter’s arc by removing the primary motivation for him losing his powers. There was very little time for us to see his pain in being apart from MJ. Further, by losing the voiceover at the end of 1 we don’t ever really understand why Peter can’t be with MJ, which makes the separation aspect artificial. There was also none of the pain of “Spiderman as menace” which is an additional motivation – and has a payoff in the train rescue. Hero Within also lacked humour entirely, which I think was a mistake. It made the film overly serious, which doesn’t really fit the tone of Spidey. On the whole, this was a nice idea, fairly well executed, but ultimately ended up being a decent film, rather than a great one. Spidey 2 is still the go-to film for Spidey fans, but this one is worth a spin just to see the films from a different angle.